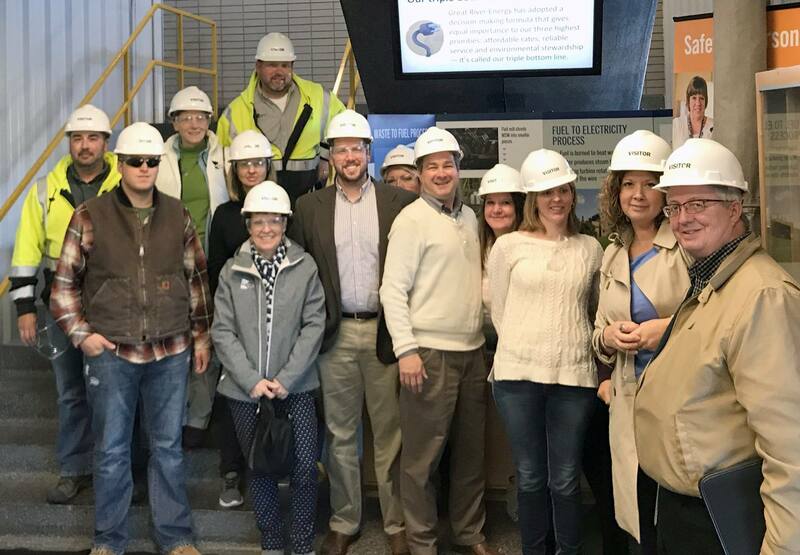 MREA staff had the privilege to tour Great River Energy's Dickinson Converter Station in Buffalo as well as their Resource Processing Plant, the Energy Recovery Station and the System Operations facility in Elk River. Among the facilities, The Dickinson Converter Station, our first stop, was the most fascinating. Behind the building we toured, was substation equipment, similar to what other high voltage substations look like around the country. Inside the building we got a close-up of the valve hall, the heart of the facility, which transforms DC power into AC power after its long trip from Coal Creek generator. There aren’t many such facilities in the country. The yellow and red boxes on the map below shows all of the DC converter stations in existence in North America. You can spot the red box around the Twin Cities area – the Dickinson Converter Station, at the end of the DC line extending into North Dakota to bring Coal Creek power down to the Twin Cities area.